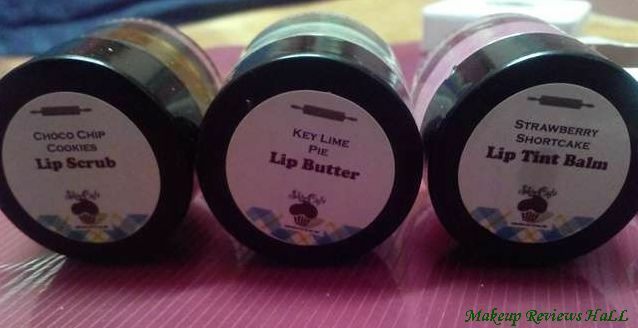 Skin Cafe is a brand which makes organic high quality lip products, as its tag line says, “handcrafted treats for your skin”. When I got a PR Request from this brand, I instantly visited its website to know more about this brand and trust me, I was very much impressed just by looking at its awesome range of organic pure lip care products. Being handmade and natural, the pictures were super pleasing to look at. 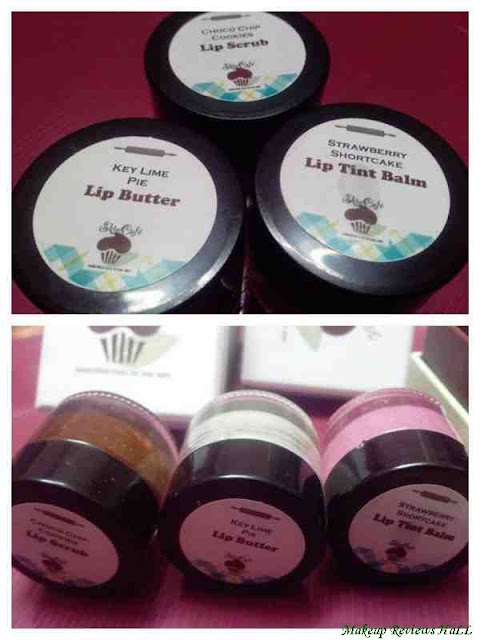 I simply could not wait to try their products, so am here to share my experience with its lip scrub, lip Butter and lip tint balm. The aroma is pure chocolate. The texture is soft and gentle as this is made of pure cocoa nibs hand ground coarsely and absolutely drenched in jojoba oil. Usage - For best results, scrub gently, wash off (preferably with warm water) and follow with a lip butter or lip tint balm. Price - Rs 950/- for 9 gm. The aroma is a mix of fruits and berries that reminds you of sudden rain on fresh grown grass, unexpected surprises, and pure energy. The texture is soft, easily spreads on the lips and gets absorbed quickly and does not leave a greasy film on your lips. Usage - For best results, use after a lip scrub. Price – Rs 950 for 9 gm. The aroma is of comfortable strawberries of course, with a barely-there hint of vanilla. The texture is of a soft, easily spreadable balm. Dollops of mango seed butter get absorbed super quick, leaving your lips soft and subtly tinted. The color is a soft and subtle reddish pink - perfect for casual day wear. Price - Rs 950- for 9 gm. All products are Paraben & BHT free, no added colors, no chemical preservatives and no microbeads used in lip scrubs. Let me start with the beautiful, convenient and super tempting packaging of these lip products. 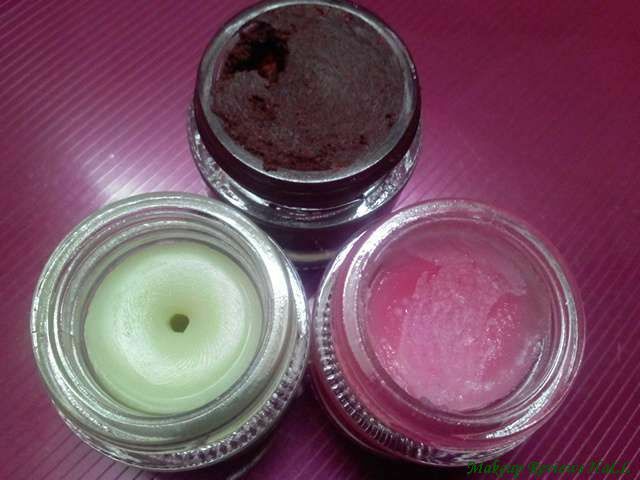 All the lip products come in beautiful round transparent glass jars with the clear picture of the product inside. The jars are really sturdy, with very smooth finish and super cute look at. I know most people don’t find jar packaging very hygienic but I like using lip products specially lip balms in jar form since they are super easy to use and can be refilled with your own homemade tinted lip balm, the way I did with one of my jars. My only concern with these jars is that they are little heavy to carry and could easily break with fall. But still love these and would definitely prefer over the cheap plastic ones. This scrub smells heavenly. The fragrance is so divine and actually feels like a chocolate muffin that one really has to resist yourself hard to avoid licking it. I used pea size of the scrub and gently rubbed it over my lips making sure I am not at all harsh to hurt the sensitive area. Then after leaving this chocolate cookie scrub on my lips for about a minute, I washed my lips with cold water. Immediately washing the lip scrub, I applied this lime lip balm to moisturize my exfoliated lips and prevent it from drying. Exfoliation is always followed with moisturization to prevent any harm and thats what I did here and instantly I could see my soft supple lips in seconds. The smell of this lip butter is again very buttery, creamy and could easily relate to some sort of creamy cake. I used generous amount of this lip butter to nourish my entire lips nicely. This strawberry tinted lip balm have a nice light pink tint to it and looks very creamy with smooth texture. The balm smells very similar to a strawberry milk shake as the name says. This is something very common in all these products that they smell so heavenly that one is totally taken away by their ultimate fragrance. I have used this lip balm many times, sometime after using lip scrub and butter and sometimes above a pink lip pencil. Every time I got great results adding to my lip shine and hiding fine lines. It was just that the color of the tint looked more radiant on the lip pencil. Along with this, I also experienced another great benefit after using this lip balm, that it made my lips look more plump. I do not know its really does this magical plumping or its just my observation. I am putting my before and after picture ( after entire lip care with scrub, butter and balm ) for your reference. Though the picture is not so clear because of extra zoom, but I am sure would clearly see the visible reduction in chapped lines. This is all about these Skin Cafe Lip Products and my experience with these. I have really enjoyed using all these homemade pure natural, free from chemicals products on my lips. It would be great that other such organic handcrafted products based brands come more into society that more and more people are benefited by their use. Natural and pure of high quality. Comes in beautiful convenient packaging. A complete set for lip care. Expiry date within 3 months of manufacturing. Labels: HOME MADE., Homemade DIY Products, LIP CARE., Lip Color. Choco lip scrub :) Sounds yummy.